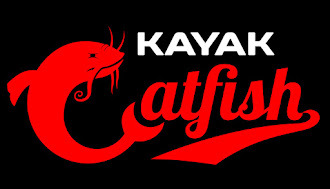 If you want to catch catfish from your kayak, you are going to need some bait. Catfish can be caught using a variety of baits including bluegill, crappie, perch, bass, carp, skipjack, etc. They don't discriminate. If it swims, they will eat it. Undoubtedly, the most popular bait for catfish though is shad. Shad are very oily and provide plenty of scent to attract catfish regardless of whether you are using them whole or cut. While many bait shops sell live and frozen shad, it is lot more convenient and cost effective to learn how to catch them yourself. The easiest way to catch them is by using a cast net. Cast nets come in a variety of sizes ranging from 3 to 12 feet although you will need to check your state regulations to see which sizes are allowed on the waters you are fishing. When throwing a cast net from a kayak, it is recommended to use a net in the 4-6 feet size range. 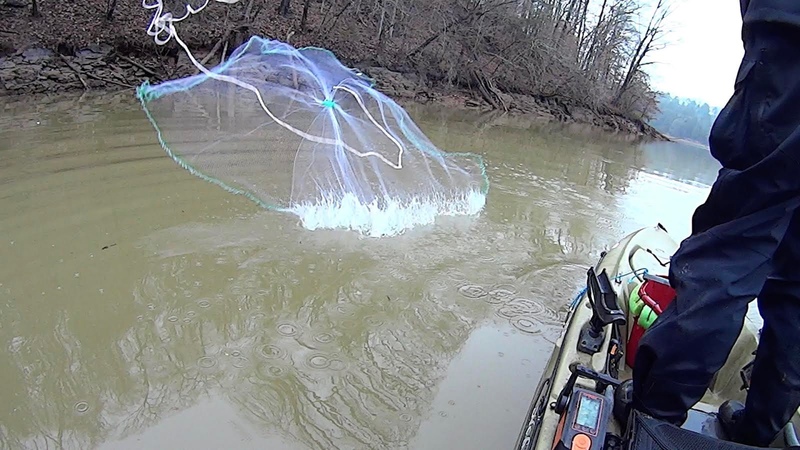 A net that size is big enough to catch plenty of shad but is still small enough to be manageable in the kayak. The chain bottom cast net offered by Cast Net HQ is an affordable option that works very well. When searching for shad, the easiest places to find them are in the calm backwater areas. Places like creeks, coves, and marinas are often loaded with shad. Keep a lookout for ripples on the water surface from shad flipping and also listen for splashes from other game fish busting the schools of shad. If you have a graph on your kayak, watch for deeper schools. Larger schools of shad can often be found on deeper points leading into coves and in creek mouths. Throwing around marina lights at night can also be very productive. 1. Be safe! Standing up in a kayak to throw a cast net can be dangerous. Do not attempt to throw if you are unsteady in your kayak or if the water conditions are rough and always wear your pfd. 3. Learn to throw a cast net with both arms. There will be times when you need to throw off both sides of the kayak and it will be helpful to be able to throw with either arm. 4. Take your time. It is better to make one great throw than ten bad ones. Make sure you are positioned and ready to throw before taking your shot. 5. If you are going to use live shad, have your bait well ready before throwing. Shad are not very hardy and will die quickly if you don't get them into your tank immediately after catching them. Shad are a great bait to use and are easy to catch once you master throwing the cast net. If you want to learn how to throw a cast net, check out the video link below for a full tutorial on how to throw a net from a kayak.